These Commission Summaries are intended to provide highlights of the First 5 LA Board of Commissioners’ actions to advance the outcome areas of First 5 LA’s 2015-2020 Strategic Plan. At the January 14 Commission meeting, highlights include a presentation on First 5 LA’s long-term financial projections, demographic presentations on children and families in Los Angeles County, approval of an allocation of remaining funds from the Los Angeles County Early Care and Education (ECE) Workforce Consortium and a contract renewal with Children’s Hospital Los Angeles. The Board of Commissioners meets on the second Thursday of each month at 1:30 p.m. unless otherwise indicated at the First 5 LA offices. All meetings are open to the public and agendas are posted on our website at least 72 hours in advance. Please check our Commission Calendar for all updated meeting information and click here for Commission meeting packets, agendas, summaries and meeting notes. On the Consent Agenda, the Board approved the allocation of remaining Los Angeles County Early Care and Education (ECE) Workforce Consortium funds to support specific ECE quality improvements aligned to the 2015-2020 Strategic Plan ECE outcome area. At the conclusion of the ECE Workforce Consortium’s contract in June, an estimated $2.5 - $3 million is estimated to remain. In other actions, the Board approved a two-year, $133,333 contract renewal with Children’s Hospital Los Angeles to support their ability to provide training and technical assistance for the First Connections program. 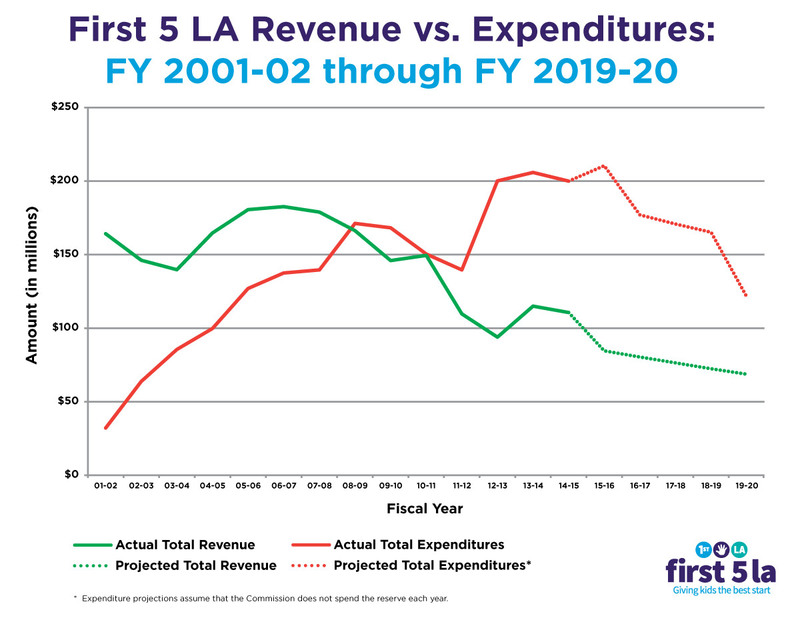 Funded by a declining revenue source, First 5 LA’s finance department utilized long-term financial projections to present Commissioners with a picture of revenue and expenditure trends that illustrates the long-term implications of funding decisions. First 5 LA’s total fund balance is projected to decrease by 86 percent by the end of the 2015-2020 Strategic Plan, from $536.6 million in July 2015 to $74.4 million by June 2020, according to First 5 LA Finance Manager Alison Mendes. To ensure First 5 LA lives within its means, the Commission must adhere to the Governance Guidelines which call for initiatives to conclude consistent with their contract end date, and should consider efficiency and cost effectiveness when pursuing new programs and activities. To set the demographic and community context for First 5 LA’s work by exploring data about how children in Los Angeles County are faring, Commissioners heard presentations by Dr. Dowell Myers and Dr. Jacquelyn McCroskey. 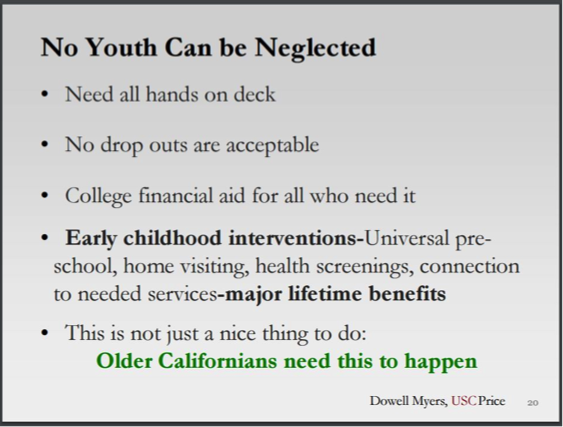 Professor of Policy, Planning and Demography at the USC School of Public Policy, Myers explained how a declining number of young children and a soaring senior population in California and Los Angeles County are spawning a critical need for increased support for early childhood interventions. McCroskey, Professor of Child Welfare at the USC School of Social Work and Co-Director of the First 5 LA co-funded Children’s Data Network, discussed how the Connecting the Dots snapshot data effort connects to First 5 LA’s 2015-2020 Strategic Plan at the individual, family, community and systems level. With First 5 LA’s new 2015-2020 Strategic Plan’s focus on systems and policy change, First 5 LA’s Policy and Intergovernmental Affairs department provided Commissioners with an overview of the agency’s approach to these investment strategies. 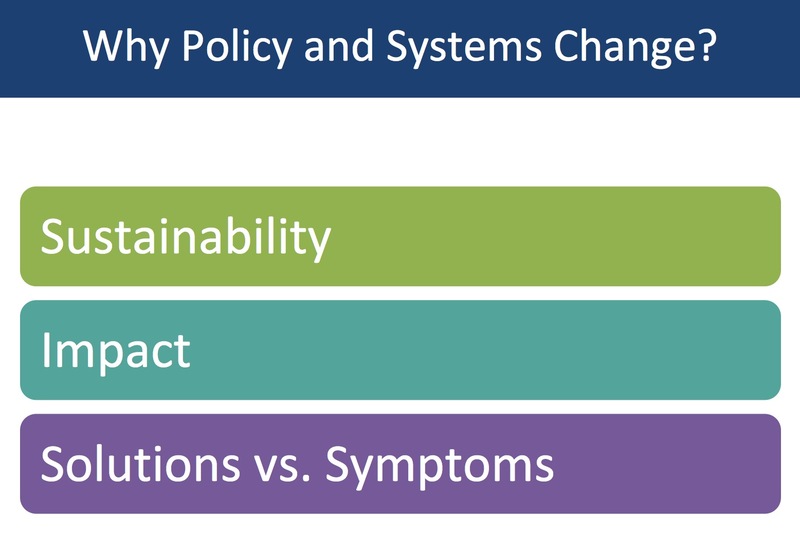 This included a presentation by Barbara Masters, Principal, Masters Policy Consulting, on the definition of policy and systems change. Masters outlined the importance of understanding contextual factors, cultivating partnerships and selecting effective strategies and tactics to develop First 5 LA’s initiatives.